Thanks for the latest update to 4.0.3. I have the HikaShop Essential version and I have noticed that when an order is confirmed (through the Bank transfer) a confirmation e-mail of the order is not sent to my site’s admin e-mail address. This did happen up until HikaShop Essential 4.0.2 and I believe this happens automatically. Is this something you have now stopped from happening in the latest Essential version? Is it an additional option now, if so where can it be configured? Or is this a bug? Anyway, did this issue appear only with Bank Transfer ? Can you try to process some test with another email and a different email hosting ?. Last edit: 2 weeks 6 days ago by Philip. Thanks for your reply. Your suggestions in the image above would have no effect with my problem as those e-mail addresses relate to the creation of an order (not confirmation) and the payment of an order subject to an online payment notification. I think the problem happened when I installed the Hikashop Starter edition manually, by mistake, when updating to the latest release instead of the Essential edition. When I reinstalled the Essential edition again (over the wrongly installed Starter edition), I noticed this problem with the e-mail delivery. I only resolved this by restoring the site with a previous back up. Perhaps you can check with your test sites if this issue is caused by a mix up when updating Hikashop with the wrong edition. 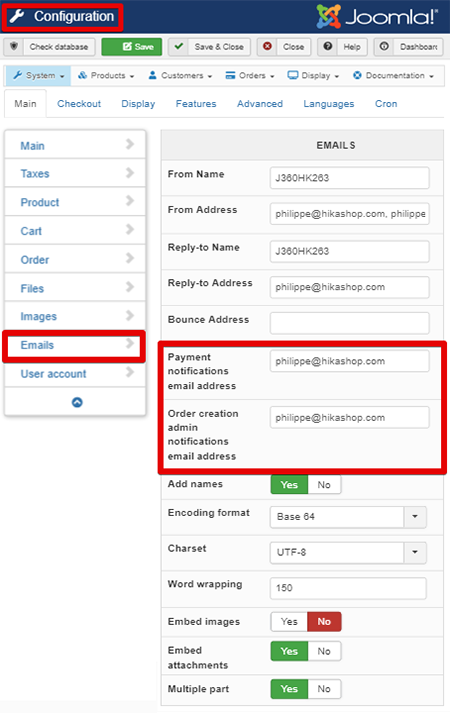 When you change the status of an order in the backend, you have a setting to send or not a notification email to the customer. There has never been the sending of a notification email to the admin with that function (since you're the one doing the confirmation, you don't need to be notified), be it in HikaShop Starter, Essential or Business, with any version of HikaShop. Now, with the Business edition, you can edit the order status notification sent to the customer to add your email address in the BCC field of the email. However, the payment notification email that is sent when a payment plugin receives an automatic payment notification from the payment gateway is not sent for manual order status change in the backend. If you lost the sending of that email when you updated/upgraded your HikaShop, I can only conclude that the code had been modified in one of the core files of HikaShop to allow for that.